The number of mobile phone users in the world is expected to surpass 4.6 billion by 2019. With 237 million people in the United States currently using a mobile phone, it’s unlikely you will see a person without a device in hand. Researchers are studying the impact of spending too much time online, but there is a particular focus on young people and one polarizing question: should cell phones be allowed in school? How Much Are Teens Using Cell Phones? A recent Pew Research Center study found that 92 percent of American teens go online daily, and the percentage increases to 94 percent for teens with access to a smartphone. 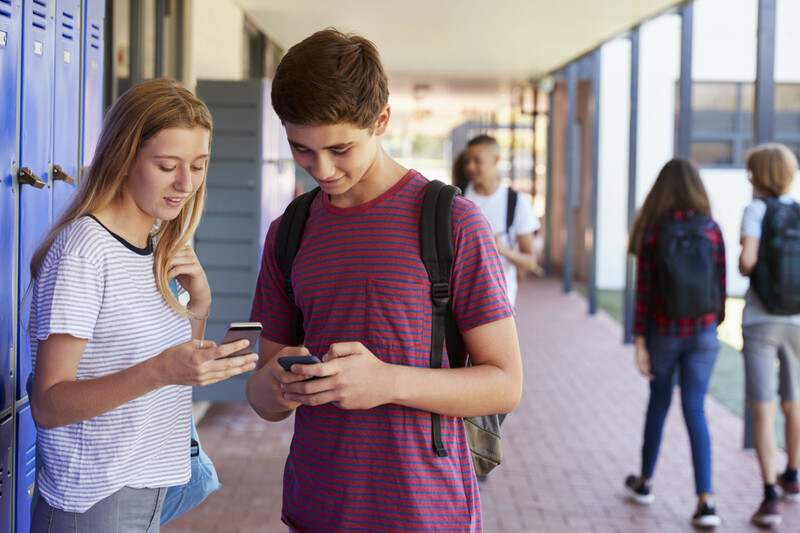 Nearly 75 percent of teens have access to a smartphone, and with open Wi-Fi networks in schools, libraries, and at home, staying connected is effortless. For teens, being connected to the internet also means being connected to friends through various social media platforms and texting applications, such as WhatsApp. Educators are battling for attention as a student’s focus is directed to the recent notification that has lit up the student’s screen rather than the lesson at the front of the class. As a result, educators and researchers are asking if cell phones should be allowed in school and if a balance between tool and distraction is possible. Research from Asurion found that Americans check their phones every 12 minutes, and with smartphones’ functioning as our alarm clocks, appointment keepers, and even house keys, it is easy to understand why we are so easily distracted. Teachers already struggle with maintaining students’ attention during class, and with cell phones’ providing other ways to “escape” the classroom, many teachers feel that students’ grades have declined as a result. Research supports this theory and has shown that multitasking can be detrimental to one’s academic performance. Checking Facebook while listening to a class lecture can actually increase the amount of time that students will have to study at home since they did not absorb the content fully in the lecture. The distraction provided by social media apps, such as Facebook, Twitter, and Instagram, can potentially lead to signs of addiction as well—users may experience some form of agitation or anxiety when their phones aren’t around. There are even preliminary research findings that longer periods spent on digital devices correlate to decreased feelings of mental well-being. It's a strong case against the use of cell phones in school, and some schools have even implemented a zero-tolerance policy for the use of cell phones. There is not yet enough research, however, and educators, parents, and students are still divided on if cell phones should be allowed in school. Cell phones, tablets, and other devices open up a world to access facts and ideas. If a student needs to define a word, a search on the internet will quickly return the definition and thousands of other pages with related content. There are also hundreds of educational apps to help students keep on top of their schedules and coursework, such as Moodle, or even to help them learn new languages, such as Duolingo. For students who have difficulty conceptualizing ideas or engaging with topics such as biology, the use of devices has made it easier for instructors to share educational videos. And these aren't the hour-long, droning videos of the past. Short videos are proving to be more effective in capturing students’ attention and developing their understanding of the material. These videos are paired with active learning tools, such as answering a poll or completing a test, to help students comprehend the content. When it comes to focusing on an assignment, allowing students to listen to music can be beneficial, as it helps quiet the unconscious attention system that shifts to whatever our senses determine to be significant. One student’s clicking a pen can be incredibly distracting for another student. Music can help remove these distractions and shift a student’s focus to the task at hand. So, Should Cell Phones Be Allowed in School? Research on the effect of teens’ cell phone use in school is still in its infancy. With the wildfire growth of students’ access to smartphones and other devices, educators are working hard to identify the right balance between function and fun. As smart home devices emerge and wearable technologies become further integrated into our lives, we may be at a point where we can’t separate ourselves—and students—from technology.